This beautiful two story home offers lake views from almost every window. There is a big lakeview deck across the back of the house. There is a new spa on the deck as well as tables, chairs, chaise lounges and heat lamp. There is level, easy access and a six car parking pad. The lawn in the backyard offers fabulous views of the lake. Grab your towel for a short walk to a private homeowners sandy beach along with two piers, BBQ's, lawn, ping pong and swimming platforms. We also have a backyard firepit for roasting marshmellows and hot dogs. Spacious lawn for playing. Ski enthusiasts will enjoy a short drive to the major ski areas. The Homewood Ski Resort is only five blocks away and access to Alpine Meadows is only three miles away. Cross country skiing trails are nearby. Trails for hiking, mountain biking and regular biking are a short distance from the house. Lots of wonderful restaurants and shopping nearby. We have rented and stayed in many locations around the lake for the past 30 years and we know the West Shore is the best shore. The area is beautiful and quiet. The lake is always quiet on our McKinney Bay as the prevailing winds are always from the West. It is the best side of the lake for water skiing and boating. The view is great and when you are on our deck you feel like the lake is right there.It is a very short walk to the lake down our little walk to the lake. It is a short walk into the little town of Homewood to have a great meal at the local restaurant or a latte at the market. There are 3 full baths and 1 1/2 bath. The little village of Homewood is 4 blocks away with the marina and a small store with all necessities. They also rent paddle boards, skis and boats. The house has windows across the back and has a full view of the lake. The highway is below the hill to the lake and is not visible. There are gorgeous views of the mountains across the lake. We have several portable heaters. The washer is in the unit and not shared. The dryer is in the unit and not shared. level parking pad for 4 cars. Bath towels provided but not beach towels. There is wireless high speed internet. (2) There are two refrigerators. Dining Room table will seat eight and can also accomodate two folding chairs. Another table will seat 4. There are 3 TV's in the house. (3) The 3 TV's are connected to cable. Games plus pool table available in Game room. There are 15-20 VHS movies. There is a full lawn in the backyard. The deck is across the back of the house facing the lake with two heat lamps, tables, chairs and the spa. There is a sports rental shop down in the village. There is a rental ski shop down in the village a few blocks away. Tennis courts in nearby park. Hot Tub/spa is on deck. Hot tub on deck, Fireplace with gas logs, Cable TV(3), VCR and DVD, Full Kitchen with new ovens, new gourmet stove and new microwave, all Cooking Utensils provided, Game Room, No pets, Check out time 10am, check in time 4pm, Linens provided, Blankets, comforters and pillows provided. Firepit in backyard. 12 of four families stayed in this beautiful house for Christmas reunion. We all had a great time! 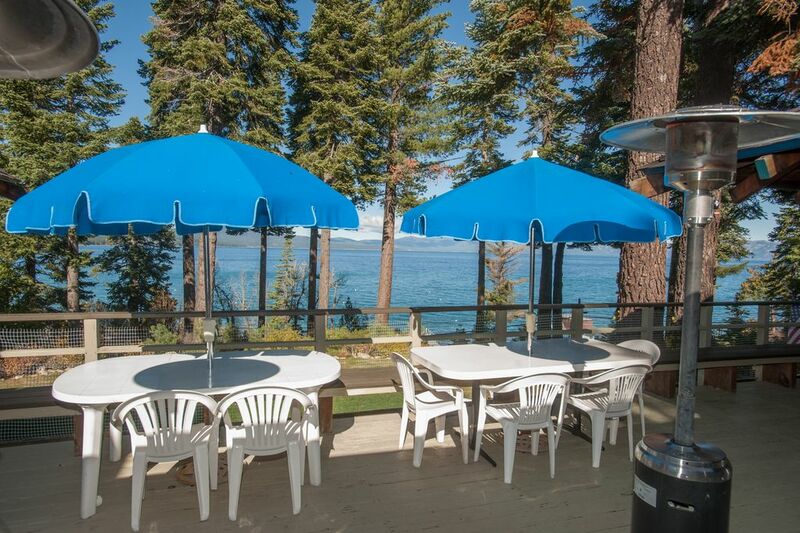 The house has a beautiful view of Lake Tahoe and is very close to the Homewood ski resort! Inside of the house, we have everything we need for a whole week vocation. The decoration in the house are full of fun. The open space in dining room, living room and deck was big enough for the interaction among a big group. Downstairs game room was a big hit for sure. Our boys were able to enjoy the pool and other games there instead of thinking about electronic devices all the time. We're so appreciated for such a wonderful place for them to play with each other. Suzanne, the owner was very helpful in answering our questions and very friendly on the phone. We all love this house and wish to come back in summer to enjoy the beach more. Thanks for your review. We are glad you enjoyed the house as much as we do. We hope you come back in the summer. Surprised with a very nice bottle of wine along with birthday greeting. Perfect Tahoe getaway. Great location with beautiful views. Beautiful backyard. Quality beds and bedding. Easy walking to Chambers Landing. Spectacular sunrise and sunsets views. Adequate parking. Suzanne was wonderful to work with. We enjoyed having Julie and her family and friends use our home. They took very good care of it and we look forward to them returning next year. Great family friendly cabin with gorgeous views of the lake! - For the seniors: very accessible -- bedroom, living area and deck all on one level. Beautiful lake views from master bedroom as well as the living room, dining room and deck. - Young adults: plenty of space to interact with the kids or retreat to a quiet area--both inside and outside the cabin. Close to favorite restaurants and stores. - Kids: Lots of sleeping options! Downstairs game room was a big hit as was the lawn area. Plenty of space for badminton, croquet, corn hole and other active games. - Everyone enjoyed the private beach which has a lawn area, sand area, and boat dock. We rented paddle boards and either swam or paddled to the large lily pads anchored near the dock. Seniors sat in the shade on the dock and enjoyed watching the grandkids swim. As usual VRBO was very professional and Suzanne, owner and host was very pleasant and helpful in answering some of our pre-trip questions. If you're looking for a great multi-generational vacation rental you will find it here! We appreciate the very positive review. For people as finicky as our family is, this was very nice. Beautiful views of the lake, close to lots of fun things, and easy to get to. We had a great week, with 12 of us from age 8, to 80! We stayed with another family and had lots of kids. The space is great for giving the kids a place to play. Beds were comfortable, hot tub was great, kitchen was well stocked, and the view was amazing. Suzanne was very helpful and accommodating prior to our stay. Would definitely stay here again. Only complaint is it is not a true 5 bedroom. 4 bedrooms with beds, a playroom with futon and a dining room with a pull out couch that was broken. We made do though and had a great time. Thanks for the positives remarks regarding our house. We were not aware that the pull out couch was broken. Thanks for the heads up. Amazing home -- so much character and charm with AMAZING views. I've started three reviews. But what I want to say is this is a home with character and charm. It is a place the owners vacation - not just a VRBO - and they care for it AND YOUR ENJOYMENT so so so much. Suzanne - the owner - called us multiple times to make sure that the plow man was working right, that the house was in good working order for us, that everything was good. It was amazing. Generally speaking, you never hear from the owner of the house. Suzanne wants to be bothered if things aren't perfect. She wants you to call and let her know if things aren't 100% as they should be. And she also wants you to love their home as much as she does. We will be back here. (BTW, the ski lease on this is an amazing value, we missed out this year). Hiking nearby, 10 mile bike path out front door, Cross Country Skiing at Olympic trails which are only @ 2 miles away. Chambers Landing is only 3 blocks away with a large public beach, pier and bar. Great place for the teenagers and college kids. Only 1 block away from McKinney Shores Homeowners Association private beach, pier, BBQ. We rent on a first come, first served basis. Security deposit is equal to one nites stay. The house is non smoking, no pets. We do rent the house from Saturday to Saturday. Cancellation- If we can rerent the house for that same time period, your money will be returned. If not, we will return your deposit and the cleaning fee.